If there’s one thing horse people understand it’s the importance of connection. To me connection with the horse starts on the ground. Once that’s achieved connection in the saddle is more easily achieved. I like to hang out with my horse in the arena. Chase him around a bit if he has some extra energy. When he’s done he happily reconnects with me, following me around like a giant puppy dog eager that I might share with him whatever tasty carrot morsel might be stowed in my jacket pocket. It’s such a peaceful, happy time. Occasionally I’ll bring my iPhone with me and get creative. He loves the attention so it never poses a problem. I got experimental one day last month and focused on shadows, which have always fascinated me. I’m thrilled with the results. 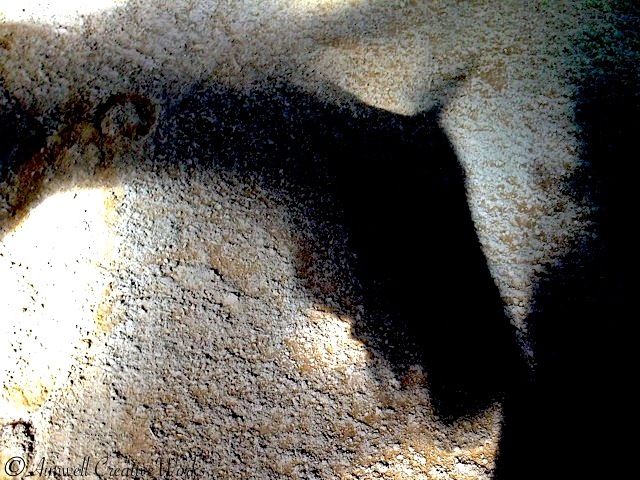 This entry was posted in Animals, Art, Daily Post, Equestrian, NaBloPoMo, Nature, Photography, Shout Outs and tagged Aimwell CreativeWorks, connection, Dorothy Chiotti, Equestrian, Equine image, Horses, Light and shadow, Peace, Photography, postaday. Bookmark the permalink. You really make me miss horses. Even (maybe especially?) the smell of horses, the barn, even the sweaty horsy smell of well-broken in chaps. Great piece, thank you.